Have you ever wondered how it would be to hire your personal photographer? 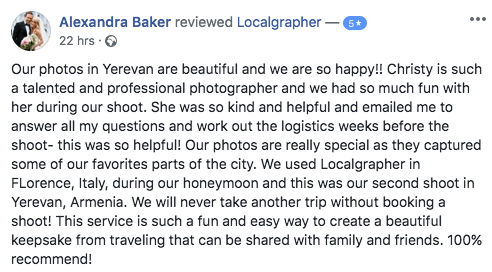 Angela is a professional localgrapher and is ready to help you to capture your memories from this amazing city. You decide whether you want candid or posed photos, or if you want Angela to act more like a paparazzi photographer. Book Angela, vacation photographer in Naples, now. Fresh, natural, full of colors. I like nature, it is always a source of inspiration, I like food that in Naples is delicious, I like sea in all season! In Naples there are many beautiful places where to go for a photographic shoot, you can discover the beauty of an ancient city in the center full of artisans small shops and pizza makers, you can go by the sea in via Caracciolo with the beautiful dell'Ovo castle in background or in the Santa Chiara church cloister with his unique handmande tiles. But Naples is well known for the beautiful view of the city from Posillipo hill and Sant'Elmo castle, two wonderful location for a shooting. One romantic place could be the Corricella Village in Procida Island where time seems to be stopped at some centuries ago. We could easily arrange a shooting in the little known Pozzuoli town and Averno lake, two places with monuments of roman empire and amazing view.